Interested in attracting hummingbirds to your yard? The ruby-throated hummingbird is most predominant in two-thirds of North America. During the winter months you can find them from southern Mexico to Costa Rica. Each spring the species arrives in the Gulf Coast by early March and spends the next 2 months migrating north to arrive in late April or early May. 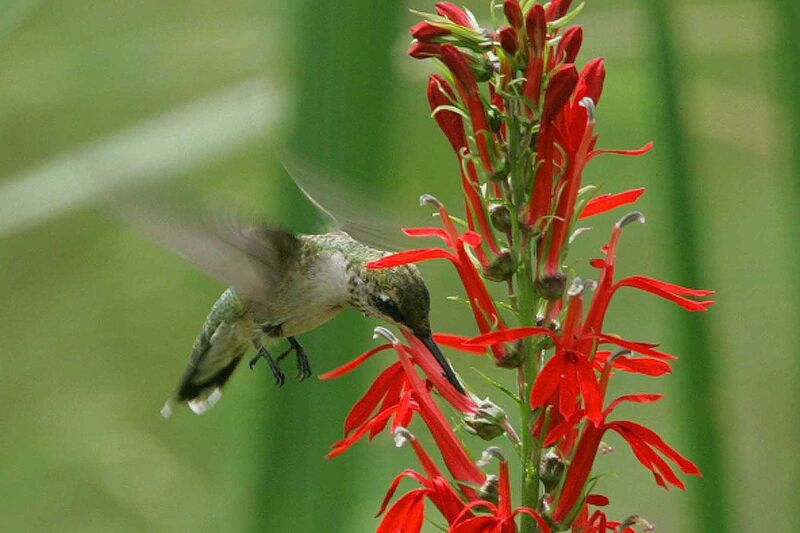 Migrating hummingbirds start to visit flowering plants and nectar feeders in March and stay around until May. From Cape Hatteras southward, in Florida, and especially around the Gulf Coast, is different from the rest of the eastern United States. Here hummingbirds are likely to be present year-round, with both higher diversity and greater numbers of birds present in winter! In coastal Texas and Louisiana you may find hummingbirds visiting feeders in later winter and early spring. Growing plants that are indigenous to your area is a great way to both attract and help the hummingbirds you love. Native plants provide shelter and food, including a healthy environment for insects, part of the hummingbird diet important during breeding season. Give this bush room to grow; it can be 10 feet tall and wide if not pruned. There’s no need to prune, but if you want to, do it in late winter. It is a heat- and drought-tolerant shrub available in large, dwarf and miniature varieties. The foliage becomes increasingly bronzy-red from summer into fall, and the reddish-orange tubular blooms attract hummingbirds. There are some 900 species in the genus Salvia. Their easy-care attitude makes them ideal candidates for the colorful, low-maintenance 21st-century garden. Sun and a well-draining, compost-enriched soil may be all salvias need for months of bloom. Some salvias even tolerate poorer soils. Otherwise, cut plants back and apply a balanced fertilizer in spring. Prune and fertilize again in midsummer. Trumpet vines probably are the single best hummingbird vine. Our native trumpets are the ones with the orange tubular flowers that bloom on fences and trees all over Houston. Don’t transplant these into your yard; they are truly invasive. Nurseries carry more “controlled” trumpet vine cultivars such as `Madame Galen.’ They prefer bright shade with no direct sun. There’s an entire family of plants called Cuphea, which include the cigar or firecracker plant (Cuphea ignea), the Bat-Faced Cuphea (Cuphea llavea), and the ‘Pink Mist’ Cuphea (Cuphea varia). Cupea ignea is a spreading, ground-hardy perennial has orange and yellow tubular flowers. Cuphea llavea is a low-growing, spreading perennial and has an interesting little red flower with purple ears. It’s a drought-tolerant, sun-loving perennial with tiny tubular blooms that open at the end to resemble a bat’s face. Cuphea varia may look dainty, but this tough cuphea creates an 18-inch-tall by 24-inch-wide mass of small green leaves tinged with burgundy. Small pink bat-face blooms appear from spring to fall on this root-hardy re-seeder that prefers moist, well-draining soil. Native butterfly weeds are usually called milkweed. These are both a nectar and a host plant for Monarch butterflies. Texas has about 35 species of milkweed. Most of us plant Asclepias tuberosa, the 1- to 3-foot-tall butterfly weed with brilliant red/orange flowers. Grow this in full to partial sun in a well-drained area. Lantana consists of more than 150 species of shrubs and herbaceous perennials. Most are native to the Western Hemisphere tropics. They are free-flowering from spring until fall. All types can be used in containers and the trailing types are great in hanging baskets. They can fall prey to lacebugs and spider mites.